In a world where competitors are aggressively targeting your advertisers, CityXpress delivers unique solutions that create attractive new advertising models, target new and non-traditional advertisers and generate new revenue streams. CityXpress has just released the AdAmplify Commerce Platform for its print and broadcast customers. AdAmplify adds powerful new features to a proven product used for years by over 400 media companies, 205,000 advertisers and 1,600,000 consumers and that has generated over $700 million in ad revenue for our publishers. Supporting both auctions and immediate purchase, the AdAmplify Commerce Platform offers in-ad purchasing from a "widget" that you run on your site pages; an embedded commerce marketplace that runs within your site; and powerful new back-end tools to give you deep insights into the performance of your commerce site. Our "classic" 10-day event auction programs have been responsible for introducing millions of new customers to the retailers who partner with our network of media companies. And after a dozen years, our clients are finding they still perform, bringing in much-needed revenue. "This is a huge revenue generator. We run two event auctions a year, each with six-figure revenue. We keep attracting new advertisers; and incremental advertising from existing ones. And what we've found is that the more times we do it the easier it is to do," says Jay Brandt, Advertising Director of the Bend Bulletin. Our new product has re-imagined the auction, giving you great new features, including the in-ad purchasing widget to promote your auction on your home page, plus an auction site that is embedded in your pages (no more leaving your site to come to ours!). 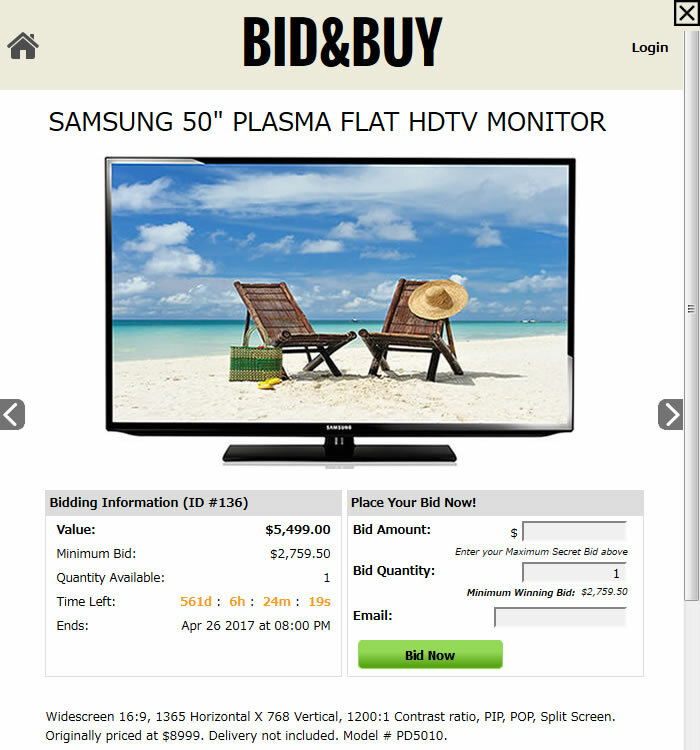 As well as auctions, you can feature buy-now items and daily deals that will keep users engaged throughout your auction. Event marketing has been enhanced with daily email blasts to your registered users and re-promotion of offers within transaction confirmations. Sign up has been simplified to encourage easy bidding and, if you are running buy-now products, easy purchasing. The reporting system has been supercharged to give you more immediate insight into how your auction is performing. Our continuous year-round auction programs are continuous revenue producers. "Year in and year out, day in and day out, this program just keeps working. We keep doing it because it is consistently our most successful initiative in recruiting new, non-traditional advertisers," says Angie Dye, Marketing Manager and auction project lead of the Sioux City Journal. Continuous auctions have all the features of event auctions: in-ad purchasing, embedded auction marketplace and buy-now capabilities, along with enhanced email marketing. The difference: rather than running a large 10-12 day event, your site is active year-round and the hundreds or thousands of items you feature are spread out over the year. If you wish, you can run one large event or quarterly smaller events within your continuous auction. The advantage: you spread the workload out across the year and give your sales rep a new tool in their bag; vendors can schedule their promotions into the periods that meet their needs; and you engage your users throughout the year, improving the quality and quantity of your consumer database. Buy Buttons are hot news and CityXpress offers the hottest product on the market today. Starting with the ad widget that supports in-ad purchasing - just click or hover on the ad and the purchase overlay comes up. Schedule up to 10 items that rotate through the AdAmplify widget. Give the consumer "in the moment" purchasing of the item with auto-login to their accounts and simple set up of new accounts. Click on the home button in the overlay and go to your embedded commerce site running as one of your pages with the complete functionality of our full auction site. Unlike other ad programs, CityXpress has created solutions that allow your clients to finance their ad campaign through the sale of their products on your site. Sell ad campaigns to local businesses. Offer them a chance to trade their goods and/or services for ad credits instead of paying cash. Auction the items on your embedded site. You keep the cash, client gets the ad credit. Converts consumer spending to incremental ad revenue. We are the market leader in online revenue generating programs for media companies, having conducted more than 1,500 event auctions in 17 countries and 8 languages. Since 2002, the CityXpress event auction program has generated more than $700 million in new advertising revenue and introduced 205,000 new advertisers to the more than 400 media partners that have worked with us worldwide. We have partnered with AdAmplify to enhance the leading media auction platform in the world. The experience CityXpress brings from pioneering and developing programs that have been the backbone of the most successful media event auctions in the world cannot be matched. And we work for and with our partners to meet the special needs of publishers and broadcasters. We value feedback and are constantly focused on offering a platform that will reduce your workload while maximizing your revenue and increasing client acquisition and retention.